BMW won't give into Donald Trump. For the second time in the span of just one week, the automaker has made it clear: It's building a plant in Mexico, regardless of what Donald Trump thinks. In an interview with German news magazine Bild published this weekend, Trump said that BMW should reconsider plans to build a $1 billion plant in San Luis Potosí, Mexico. The automaker plans to begin building the BMW 3 Series sedan there in 2019. "I would tell them, don't waste their time and money -- unless they want to sell to other countries," he said. "But I would tell BMW if they think they're gonna build a plant in Mexico and sell cars into the US without a 35% tax, it's not gonna happen." Trump has attacked several other automakers, including Ford Motor (F), General Motors (GM) and Toyota (TM), for shifting car production to Mexico. Ford actually pulled the plug on its plans to build a $1.6 billion plant in Mexico two weeks ago, and said it would invest in an expansion of a Michigan plant instead. BMW says that it will sell the cars it makes in Mexico all over the world, including in the United States, regardless of Trump's plan to impose a tarriff on any Mexican-built car that come into the U.S. The new Mexican plant is meant to be a boost to the Series 3 production that's already underway in Germany and China -- BMW isn't relocating any jobs to Mexico. 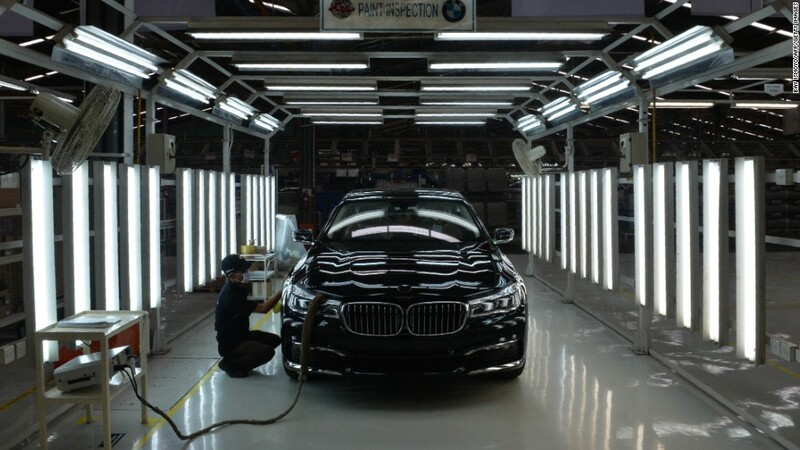 BMW's largest plant in the world is in Spartanburg, S.C., that employs 8,800 workers. The facility assembled more than 400,000 X model crossover vehicles last year, 70% of which were shipped to other countries. In fact, BMW is the largest U.S. exporter of cars. "The BMW Group is at home in the USA," said the company's statement. BMW builds far more cars at its U.S. plant than it sells here. In 2016 it sold 288,000 in the U.S.